gauge marks™ is proud to offer the finest DIY gauge face restoration packages available on the planet, and We're ready to prove it. Restore your own gauges with professional results. A full year of R&D was invested in producing our first line of gauge markings before being offered to the public. Now in our third year, we have restoration packages available for most GM 2nd Gen Fbody cars. Camaro and Trans Am gauges can be restored to factory fresh appearance. GAUGE MARKS™ are not only accurate in detail, but also made of the finest materials available. Each line, digit, and letter are precision cut from UV resistant 4mil premium vinyl, then aligned and prepared by hand. This process takes an average of three hours per set to complete. You can rest assured that only the highest quality marks make it to your gauge package. In addition to 70-78 Camaro, GAUGE MARKS ™ now offers complete gauge face restoration packages for 70-79 Trans Am. Packages are available for both 160/8k and 100/6k Pontiac Trans Am Rally Gauges. The markings are covered with a clear transfer sheet that is used to transfer the marks to your freshly prepared gauge faces. Alignment marks are provided to ensure accurate placement. The markings are adhesive backed. No glues, pastes, gels, or hairdryers needed. Once the markings have been set, the transfer sheet is peeled away, leaving only the markings on the gauge face. gauge marks™ is not a full face "overlay" product, so gauge faces can be painted or powdercoated to any desired color before applying the markings. When applied to a properly prepared surface, gauge marks™ won't peel, crack, fade, or smear and are superior in quality to paints or screen prints. Application is easy; the results are astounding. We're sure you'll agree. Thank you for choosing gauge marks™. A picture is worth a thousand words. 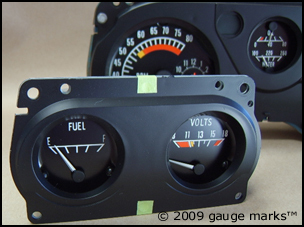 In addition to DIY packages, GAUGE MARKS ™ also offers complete gauge face restoration and calibration services. You've seen our 2nd Gen Camaro oil pressure gauge on ebay. You can now have your own clock converted to an oil pressure gauge! Contact us at info@gaugemarks.com for complete details. Have your 2nd Gen Camaro clock converted to an OIL pressure gauge. This is a gauge marks™ exclusive item! Contact us for more information on how to get your own. Take a few minutes to watch the installation video. See how you can achieve professional results in your own garage.